January 25th, 2010 by KTU | Filed under 3. Basic Structure. The framing of the cabin was straightforward. We used rough-sawn lumber and 3/4 inch plywood sheathing. I used a simple framing scheme with no headers above the windows and a single top plate on the walls. I used 3/4 inch plywood power nailed to the lumber with ring-shank nails to tie everything together into a strong and stiff wall system. 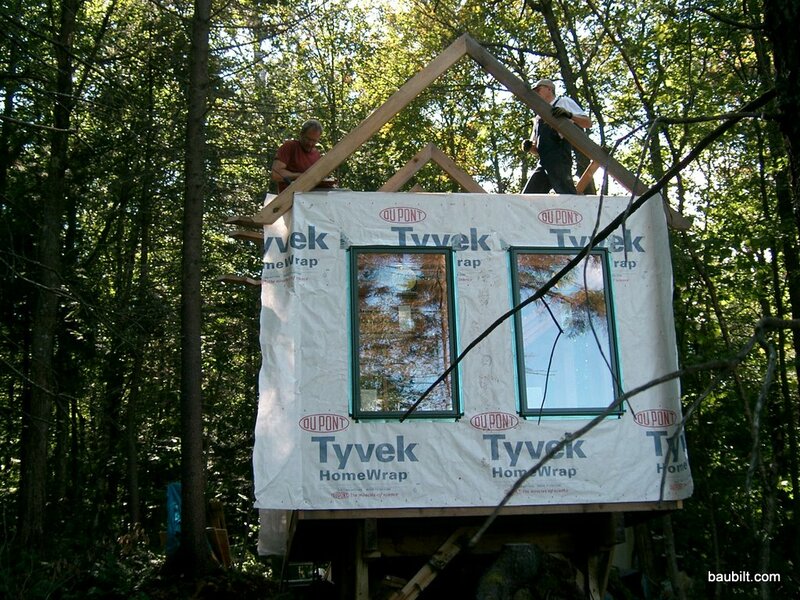 I was confident that with this heavy sheathing, the minimal structure would be plenty strong. 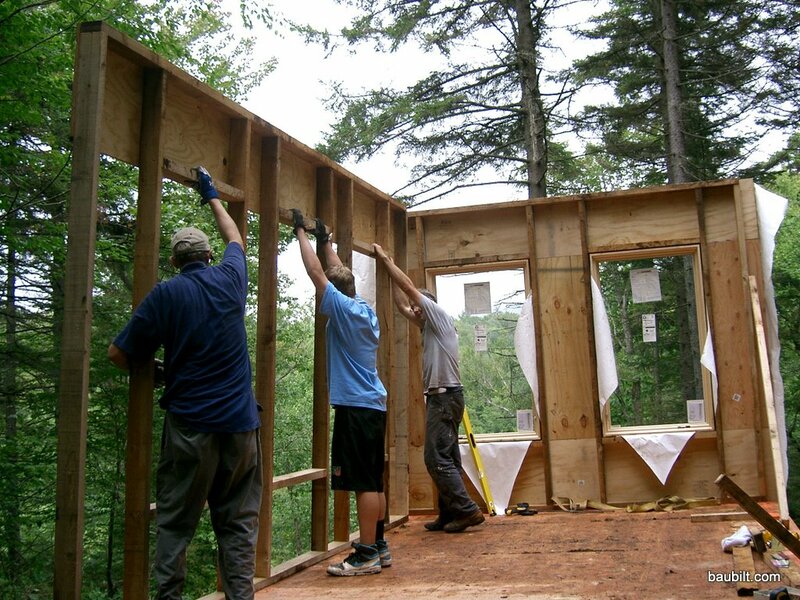 Here my father, my sons, and I are tilting up the first wall. There are just four walls. 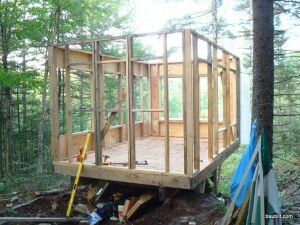 The end wall I completed with sheathing and windows before tilting up. I had help for that one, but even so, it was really heavy. I would be on my own for the final two walls, so I tilted them up as bare frames and then applied the sheathing and installed the windows after the walls were in place. 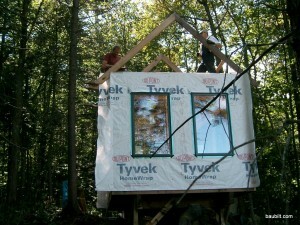 Side wall being tilted up...this time with only partial sheathing. I had to put up the others on my own, so put them up without sheathing. My father and I put the rafters up. That was pretty straightforward as well. 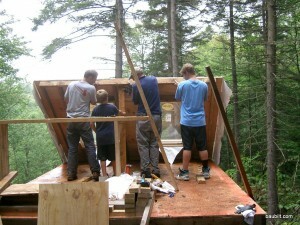 First rafters going into place. We put some blue tarps over the roof and left it for two weeks until I could get back and put up the roof panels. Starting from the deck and ending at this point was two days of work, with significant help from my father on the first day. 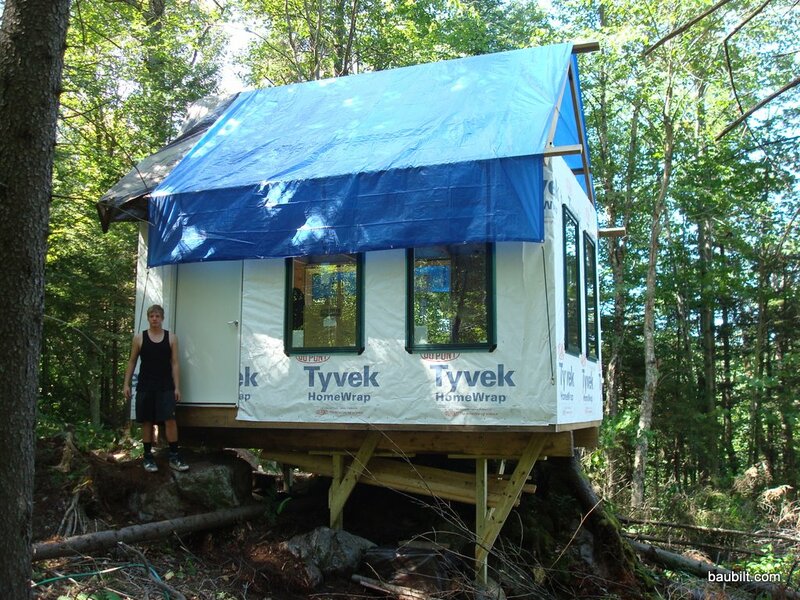 With blue tarp in place, as we left it for two weeks.